SM Joshua Colas was the favorite in quad one. After two wins and an interesting final round win against NM Ian Harris he took home first place with a perfect 3/3 score. 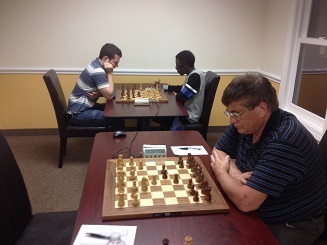 CCFC Director Melvin Patrick won all three of his games, including a nice win against Guy Colas, to win quad two. Meanwhile, tournament newcomer Danny Pelletier did not lose a single game on his way to winning quad three.